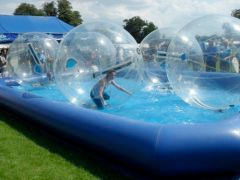 Water Buoyz bring a unique entertainment concept from the Far East to events and parties throughout the UK: Water Walking - using 6 foot inflatable water balls, you can walk on water! If you have a private party coming up with guests you need to entertain, be it a corporate event, wedding or christmas party, Water Buoyz has the perfect solution for you; let them experience walking on water! We're based in Birmingham, but we can attend events throughout the UK, in London, Sheffield, Manchester and all the major cities. 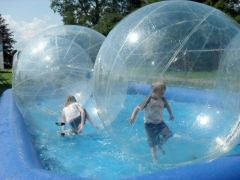 The inflatable water walking balls are 6ft in diameter, with plenty of room even for tall customers. 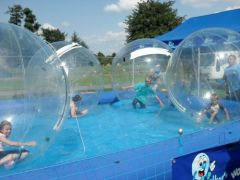 Once inside, you're able to breathe normally, and by rotating the ball in the direction you're walking, you can walk on water! It can take a little while to master controlling the movement of the water walking balls, which provides plenty of entertainment for the spectators, and for people waiting to have a go! We can provide multiple inflatable pools in various sizes, each with 5 water walking balls or more, capable of handling up to 60 customers an hour (based on 5 minutes inside the water walking ball). For our more competitive clients, races can be organised between 2 water walking balls in a pool, by dividing it into two lanes. The only requirements for the inflatable pools are a flat grassy area with little-no gradient, and if a water tank can't be supplied, mains water is needed within 100 meters of the pool. We can be seen at many shows around the UK, which are updated frequently on our Forthcoming Shows page. If you are the organiser of a show, and you want to hire us on your behalf, call us now for a quotation. If you were thinking of hiring a bouncy castle, mechanical bull or laser tag arena for your next party, don't! Wherever you are in the UK, whatever the scale of your event, Water Buoyz can provide entertainment that your guests will never forget. Water Buoyz can attend events in England, Wales or Scotland, and provide a walking on water in water balls experience in London, Birmingham, Leeds, Glasgow, Sheffield, Bradford, Edinburgh, Liverpool, Manchester, Bristol, Wakefield, Cardiff, Coventry, Nottingham, Leicester, Sunderland, Newcastle, Brighton, Hull, Plymouth, Stoke, Wolverhampton, Derby, Swansea, Southampton, Aberdeen, and many other places - call us to see if we can attend an event near you!